Help the Alumni Association support its student scholarships in the 12th year of The Shirt initiative at Ole Miss! Each year, the association introduces a new shirt showing Rebel spirit. Continue or begin your collection in 2019 by ordering shirts for everyone in your family. 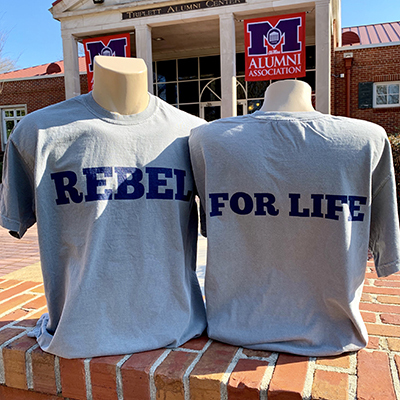 The 2019 Shirt features the slogan “Rebel for Life,” which displays your lifelong commitment to being an Ole Miss Rebel and supporter of our great university. No matter where we’re from, all Ole Miss alumni are Rebels for Life—we all hold degrees from Mississippi’s flagship university, and while we’ve left campus, our hearts remain at Ole Miss. To date, The Shirt has generated more than $70,000 for student scholarships and programs. The Alumni Association invites you to help make The Shirt initiative a continued success, and give every deserving Ole Miss student the chance to become an alumnus. Don’t miss out on buying The Shirt, supporting the Rebels and supporting Ole Miss students!